At the beginning of the 20th century, Britain's empire remained the largest in the world and included the colonies of India, Australia, South Africa, New Zealand, Canada and the Caribbean territories. However, the 20th century was the last century of this empire. Two wars in Europe brought an end to European colonialism. The rise of the German Empire ensured a change in Britain's foreign policy at the beginning of the century. In 1904, the U.K. and France formed the Entente, which later expanded into the Triple Entente that included Russia. Germany's expansion of its fleets also ensured a naval race with the Royal Navy. Maintaining naval superiority was one of the cornerstones of the empire's defense policy, so Britain established new ship-building programs at the beginning of the 20th century. In 1906, the U.K. introduced a Dreadnought class of battleship that made earlier warships obsolete. Colonial disputes also emerged in North Africa. These were largely over the colony of Morocco. The first of these emerged in 1906, when the kaiser visited Tangier and made a speech in favor of Moroccan independence. Britain gave its backing to the French, and convinced them to attended the Algeciras Conference. The second crisis emerged in 1911 as the Germans sent a Panther gunboat to the port of Agadir after an uprising in the colony. During the period of gunboat diplomacy, the French established a formal Morocco protectorate and made further naval agreements with the Royal Navy. Although the countries avoided war, it was clear that both the U.K. and France were much firmer allies than Germany might have expected. In the event of a war in Europe involving France and Germany, the British Empire was firmly committed to France. In 1914, the assassination of Archduke Ferdinand marked the beginning of the First World War. As Germany invaded France, Britain was committed to joining France in the war. Consequently, when the German army invaded Belgium Britain provided an ultimatum requesting that its troops withdraw. Germany did not remove its soldiers and instead advanced into France, so the British Empire joined its Entente allies. As the war began, Germany advanced further into France. To bolster France's lines, the U.K. sent the BEF. The Entente halted the 1st Army's advance at the Marne, and further German advances failed. Britain's involvement in this war was largely in the West; although the British and French also attempted to defeat the Ottoman Empire during the Dardanelles Campaign. The Royal Navy blockaded Germany, and this continued despite the Battle of Jutland in 1916. The German U-boat campaign of 1917 failed to defeat Britain, and gained the Entente U.S. support. The U.K. and its Entente allies won the war's final battles. Most notable of these was the Battle of Amiens where the British Fourth Army's tank regiments broke Germany's lines. Rawlinson combined tanks, infantry and planes to devastating effect as the Germans surrendered in number. The Germans accepted an armistice in November. At the Paris Peace Conference, in 1919, George met with Wilson and Clemenceau to draft the Versailles Treaty. That treaty ensured more territory for the British Empire such as Palestine, which became a U.K. mandate. Former German colonies were also obtained such as a large part of East Africa. In addition, Iraq was also another of Britain's League of Nation mandates. During the interwar period, Britain began to grant greater autonomy to the empire. The 1926 Imperial Conference marked the beginning of this change of policy, as did the Statute of Westminster in 1931. From then on the empire became the Commonwealth. In the 1930s, Germany began to overturn the Treaty of Versailles. The German army gradually expanded beyond the provisions laid down within the treaty, and further to this Germany also re-militarized the Rhineland. The appeasement policy continued during the decade as the Third Reich united with Austria in 1938 and concluded at the Munich Conference. However, after the German occupation of Czechoslovakia and Poland in 1939, Britain declared war on the Third Reich. The Commonwealth armies included troops from Canada, Australia, South Africa and India. While the defeat of France lost Britain its primary ally, the war continued after the RAF victory at the Battle of Britain. The main front for the U.K. was in North Africa and the Mediterranean, and by 1943 the Allies had won that campaign after victory at El Alamein. Hereafter, they invaded Italy; and in 1944 British and U.S. soldiers retook France. Germany and Japan surrendered in 1945. However, the U.K's wartime victory could not prevent a gradual decline of the empire. Britain was bankrupt. In addition, a pro-decolonization Labour Party got elected. India left the empire in 1947. Elsewhere, Burma and Singapore would also follow. During the Suez Crisis of 1957, Britain reoccupied the Suez Canal. But the United States did not support the invasion, and the U.N. requested withdrawal. Consequently, the U.K. withdrew from Suez. They also withdrew from Aden and Bahrain in the 1970s. In the 1960s, Britain also began to abandon its remaining colonies in Africa. British Somaliland, Uganda, Kenya, Nigeria and Zanzibar also left the empire during the decade. By the end of the 1960s, only parts of Rhodesia and South West Africa remained. 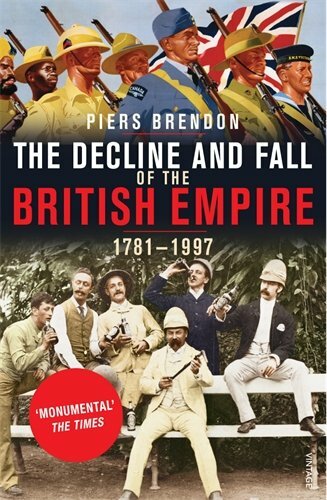 The British Empire had all but dissolved by the 1970s. Today, only a few territories of the former empire remain, including the Falkland Islands after Britain's victory during the Falklands War. Now these are U.K. overseas territories.